Time for Single Payer Health Care in the U.S. It seems to me that most Americans, regardless of political affiliation, would like to have access to high-quality and affordable health care for themselves and their families. The quality issue is an important one, even if it isn't the one receiving most of the attention right now. We'd like to think our medical professionals were competent and capable of providing evidence-based health care. Issues of access and affordability are receiving most of the attention now. We want to have some choice in the medical professionals we see, and we want to make sure they are available where we live (access). We also recognize that cost is often a significant barrier to access. We want our health care to be affordable. Prior to the Affordable Care Act (ACA), there were all sorts of problems with our health care system. The quality was not nearly as good as it is in many other Western democracies. Access was poor in many rural areas. And of course, the skyrocketing costs of health care put it beyond the reach of many Americans. Health care was far from affordable. The ACA sought to tackle the issues of affordability and access. Instead of doing what nearly every other Western democracy has done (i.e., single payer), the ACA opted to run everything through the insurance industry. The goal was to make it possible for many more Americans to access health care, and the means of achieving this goal was to make sure that many more Americans had health insurance. Not surprisingly, the ACA was a mixed success. Many Americans who did not have health insurance prior to the ACA now had it. Children were permitted to stay on their parents' health insurance for longer. People could not be denied health insurance for pre-existing conditions. On the other hand, the individual mandate fell apart, cost controls did not prevent the price of health insurance from increasing, and the legislation became politically unpopular following a barrage of Republican propaganda. Under the ACA, we still do not have health care at the same level of quality as many other Western democracies. Access is still poor in many areas, although it has improved. And while health insurance costs have increased under the ACA, they probably would be worse today if not for the ACA. Even if we all agreed to leave the ACA in place, it is clear that we'd still have significant work to do to improve it. The Republicans are now in the position of feeling like they must repeal the ACA even though they have no idea how to replace it. At minimum, it sounds like a repeal would result in roughly 20 million Americans losing their health insurance and thus, their access to health care. The Republican replacement plans that have been rolled out so far are extremely unpopular with voters, mostly because they amount to deep cuts to Medicaid and an appalling transfer of wealth from the poorest Americans to the wealthiest. What they have proposed for Medicaid would be especially devastating to older Americans, including those in the shrinking middle-class. If we circle back to the beginning for a moment and remind ourselves what most Americans want (i.e., access to quality, affordable health care), it is difficult to see how any of the legislation proposed by the Republicans moves us closer to that. In fact, their legislation would deprive millions of Americans of their health insurance while simultaneously undercutting one of the most effective health care programs we have (i.e., Medicaid). Most Americans, regardless of political affiliation, should oppose such efforts because they would lead to reduced access and higher costs. 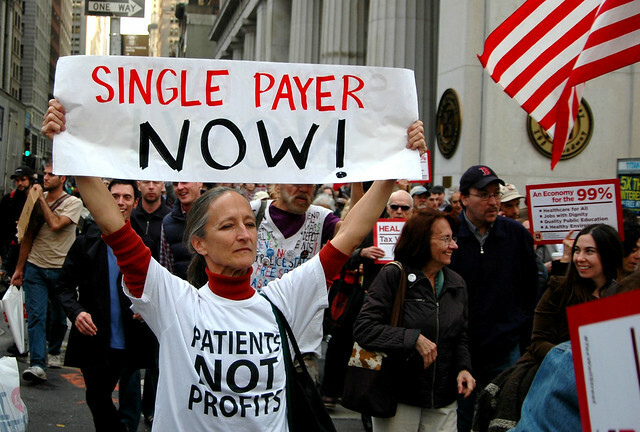 It is becoming increasingly clear to growing numbers of people that single payer is the solution. Maybe the politicians will eventually catch up to where the people are. If we are serious about more Americans having access to high-quality, affordable health care, single payer is the way to do it. Nobody is predicting that we will get it anytime soon. Our elected officials appear to be too beholden to the insurance industry. If we really want single payer, we need to make sure they hear from us. In short, we are going to have to demand it, dig in, and prepare ourselves for a fight.